After one year of pursuing some of the oddest contests I could find and traveling all over the country to reach them, Carie and I did something completely insane last week: We went on a vacation focused solely on rest and relaxation. It was fantastic to go away without an agenda, but I did spend a fair amount of time thinking about and preparing for future events. Here’s a quick look at what’s in store in the weeks and months ahead. – Co-national egg toss champion Mike Hepp and I are still plotting a path to the World Egg Throwing Championship in June. We’re still wooing potential sponsors, but we’re confident that we’ll make it to England to defend the honor of American-laid eggs. 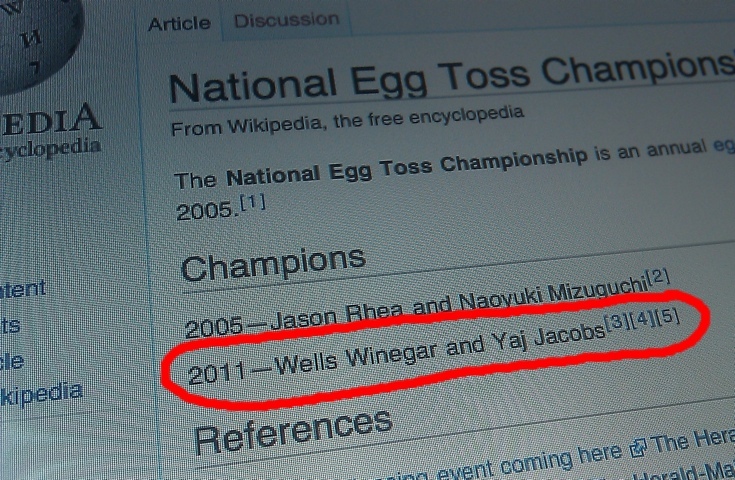 Unfortunately, I’ve had to waste some time monitoring the Wikipedia page for the National Egg Toss Championship. Last week, some hackers erased our names and added the names Wells Winegar and Yaj Jacobs as the winners of the 2011 championship, which has yet to take place. Wells and Yaj, if you’re reading this, and if you want to challenge the champs, drop me a line. But please, respect the sanctity of our Wikipedia page. – While it wasn’t an official contest, I recently tried an incredibly fun new sport. NBC 17 morning anchor Penn Holderness invited me to play a round of speed golf, which is just like regular golf, except you run between shots and combine your total strokes with minutes played to tally your final score. I’m not yet sure when Penn will air the story, but I’ll keep you posted and write more about our round later. – I’ve been challenged by a reader to compete in his upcoming 999 Challenge, in which competitors must eat 9 hot dogs and drink 9 beers during 9 innings of a baseball game. Although I keep saying that I’ll never compete in another eating contest, especially after my miserable failure at the Krispy Kreme Challenge, I simply cannot turn down an invitation to drink beer and watch baseball. It would be un-American. – On May 21, Carie and I will compete in the National Potato Peeling Contest in Elizabeth City, NC. Of course, I said the same thing last year and we never found two more teammates. But this year we will not be denied. If you think you’ve got what it takes to join our team, so long as your name isn’t Wells or Yaj, let me know. For now, I have a Wikipedia page to monitor. Wells and Yaj need to recognize who the true champs are…To be the man, you got to beat the man!! !